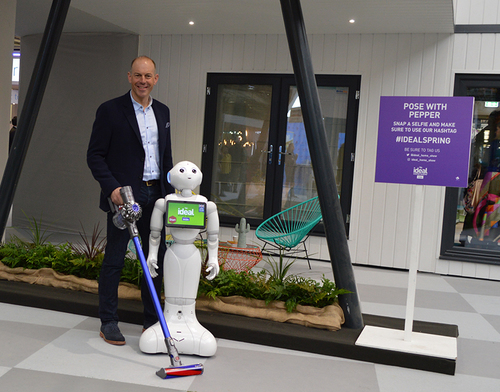 Residential revolutions and robots: new ideas for home-loving Britain as the 110th year of The Ideal Home Show opens its doors. TV’s property expert Phil Spencer was joined by robot Pepper on official opening day at The Ideal Home Show 2018 sponsored by Zoopla*: the longest running exhibition in history. Phil may have cut the ribbon to the 110th year of Britain’s famous lifestyle show, but it was Pepper who fascinated visitors as she demonstrated her interactive abilities to ‘make people happy’. Currently working as a receptionist at several offices in the UK, she can identify visitors through facial recognition, chat to guests, and arrange meetings and refreshments. The show first opened its doors in 1908, the Ideal Home Show continues the tradition of creating inspirational show homes and features, with innovation at the core of the exhibition. This year’s show homes include The Innovation Home: a Victorian city home with a twist on contemporary living, its interior designed by TV interior stylist Sophie Robinson featuring numerous devices and technologies to efficiently manage your home including Hive products; view camera, window/door sensors, active plug, leak sensor, active lightbulbs plus many other elements making this the ideal smart house. The ‘Liv-In’ beach hut sees traditional seaside cabins reinvented with overnight accommodation for up to six people, a fully fitted bathroom, open plan kitchen, wood burner and BBQ area. In addition, two spectacular garden buildings continue the British fascination with maximising every inch of living space. Celebrating 110 years, The Ideal Home Show has hosted the introduction of appliances from washing machines, dishwashers to the teasmade. With a strong royal connection, HRH Queen Elizabeth II has visited the event 11 times. This year’s show includes a royal wedding cake competition open to both amateur and professional bakers icing their ideas for Prince Harry and Meghan Markle: visitors will vote for their favourites with the winner selected on 25th March by Rosie Dummer, RosieCakeDiva. 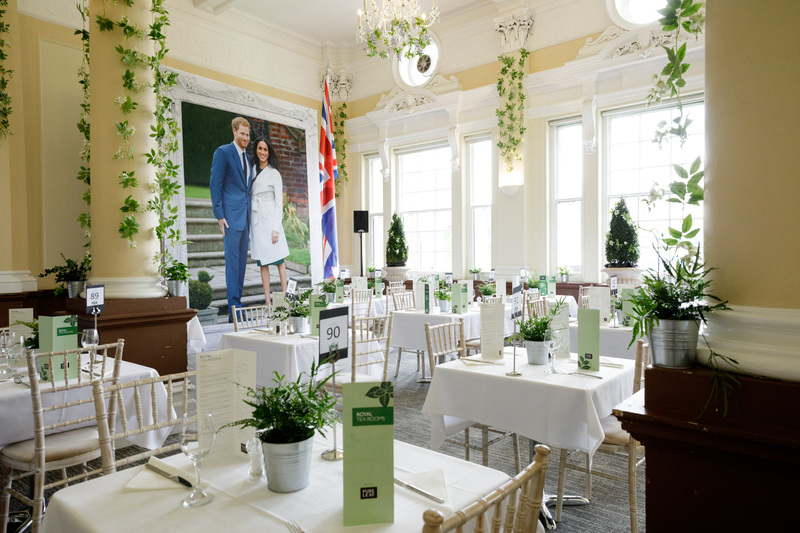 In-line with the theme The Royal Restaurant is marking the occasion with afternoon tea and the menu will include some of the royal’s favourite treats; The Queen’s much-loved cucumber, smoked salmon and egg mayonnaise sandwiches. 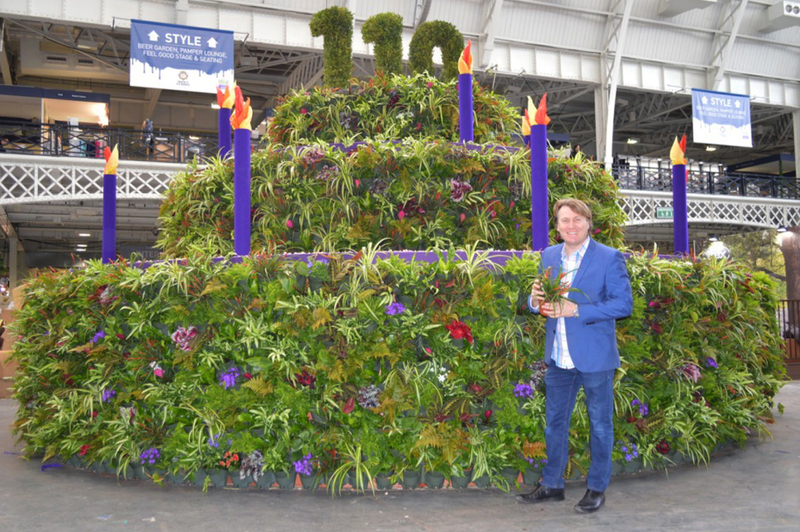 Attractions at the show include a giant birthday cake designed by Love Your Garden’s David Domoney made from over 2,200 plants reaching 6.5 metres high, with the mix of foliage and flowers wrapping around the vertical surfaces of the cake. Alongside Phil and Pepper, celebrities including money-saving expert Martin Lewis, TV’s Lisa Faulkner, Laurence Llewelyn-Bowen, Rosemary Shrager, Charlie Luxton and reality TV personality Calum Best, entertain visitors at Olympia London until 2 April. Each day hosts a line-up of celebrities providing entertaining insight into every aspect of homes and leisure. Visitors can also enjoy a number of activities ranging from ‘how-to’ craft workshops and free treatments in the Pamper Lounge. Experts are also on-hand to provide free advice at the The Renovation Hub. Gardening enthusiasts can explore the Ideal Garden section for inspiration on patio makeovers or learn about and shop for on-trend outdoor furniture. Renowned chefs Aldo Zilli, Theo Randall, Simon Rimmer and Dean Edwards along with and drinks-industry experts who will take to the Foodie Stage and Drinks Station situated within the co-located Eat & Drink Festival, with free access for Ideal Home Show visitors. The Ideal Home Show 2018 running until the 2 April, and is open from 10:00 to 17:00 Monday to Wednesday, 10:00 to 21:00 on Thursday and 10:00 to 18:00 Friday to Sunday. To book tickets please visit www.idealhomeshow.co.uk or call the ticket hotline on 0844 858 6763. *Zoopla is the UK's most comprehensive property website, focused on empowering its users with the resources they need to make smarter property decisions. Zoopla help consumers both find their next home and research the market by combining hundreds of thousands of property listings with market data, local information and community tools. This press release was distributed by ResponseSource Press Release Wire on behalf of RSM - Result Strategic Marketing in the following categories: Home & Garden, Women's Interest & Beauty, Food & Drink, for more information visit https://pressreleasewire.responsesource.com/about.